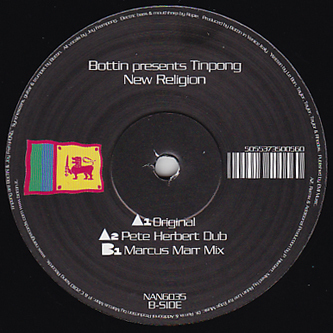 Bottin presents his new project, Tinpong, with a cover of Duran Duran's 'New Religion', backed with remixes from Pete Herbert and Marcus Marr. The group features Italian disco dude Gugliemo Bottin on keys, guitar, trumpet and production, assisted by Joy Frempong on vocals, Nelide Bandello on drums and Piero Bittolo Bon playing electric bass, flute, bass clarinet, alto and baritone sax. They spin the eternal new pop classic with a smokier, but still uptempo disco vibe, while Pete Herbert gives a brasher dub version and Marcus Marr spaces out on a psychedelic lounge mix.